So I thought I would try out this whole What I Ate Wednesday thing. If you haven't heard of it, its where you photograph all your meals for a day, and post your daily eats every Wednesday. I like what the project stands for – sharing healthy food ideas, particularly lunch and snack ideas, and getting to know other food bloggers. It is hosted by Jenn over at Peas and Crayons, so go check her out. I had so much fun photographing my food today, though admittedly my friends thought I was crazy. Also, this month the challege with WIAW is to add more vegies to your diet. I totally failed at this. Breakfast was at 6:30 for me because I have an early lecture. I had oatmeal with one chopped banana and honey and a little bit of milk. I don’t drink a lot of milk so I have long life Zymil which is crazy good for you. It tastes awful mind you, except if you mix it with other food you can’t taste it so that is ok. I love honey, so my breakfast was absolutely drenched in it. I got really hungry around 10, when I was in a tute, so one of my friends let me have a bit of her (unpictured) Mother Earth Baked Oaty Slices. Possibly the best bar I have had in ages. Lunch on Tuesday’s I always look forward to – me and two of my best uni friends go and get food, usually at Beadles, a cafe on campus. Today we ventured down into the village nearby and ate at a new cafe. I decided to have a big meal as dinner was going to be a small salad. I had a mushroom risotto, but couldn't it eat all. After lunch, I bought a muesli bar that I thought would be healthy as I figured I would get hungry while at work and I could sneak a snack. I bought an awful bar; it tasted disgusting and I still ate it. Needless to say I felt awful afterwards. No picture, because I forgot. I had to work from 5:30 – 8:30, and with my crazy amount of travel time, I knew I wouldn’t be home until late to make myself a proper dinner. So I had my standby salad – summer berry and grilled chicken – recipe coming soon. This one was a much simpler version, as I just marinated the salad in honey and didn’t caramelise the walnuts, but it was a good enough dinner. I didn't eat this though, as when I got to work they asked me to close, so as I would be working a longer shift they gave me a free dinner. I didn't take a picture of it, because I ate at 9:00, which is just awful for me, and I pretty much ate the whole burger in five minutes. The burger place I work at is healthy, and the best part is, I got to make my own burger. It was amazing. I had, on a wholemeal bun; fig paste, rocket, tomato, a little sprinkling of parmesan, pear, pineapple, brie, chicken and avocado. So that was my first ever WIAW post. Hope you guys had a better and healthier Wednesday than me! Welcome to WIAW! Last week was my first WIAW and I had so much fun, I came back this week for more! This is a great place to connect with other food bloggers...hope you come back for more! Your look delicious! 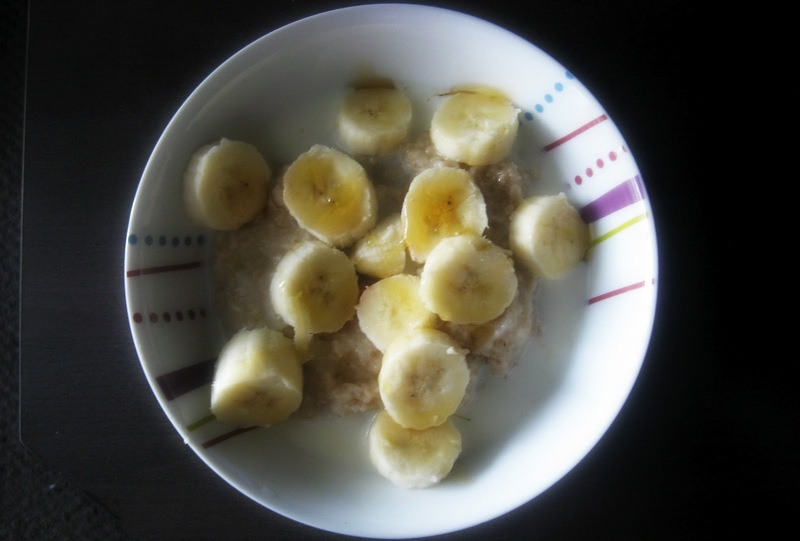 I love topping oatmeal with banana slices and honey. It's so yummy! Free dinner at work!? Lucky duck! Great first WIAW post- definitely do more! Thanks - I am definitely going to! Yeah, free dinner if I work for six hours - it's a pretty good deal haha. glad you joined in on the wiaw party! 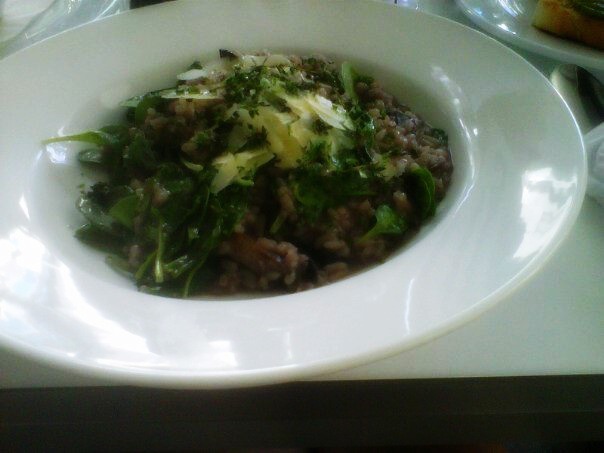 your mushroom risotto sounds really fantastic. what a treat! Welcome to WIAW, it's a fun and addicting program. I find myself losing attention at work and checking out WIAW posts; there's just so many to read! Great first post! 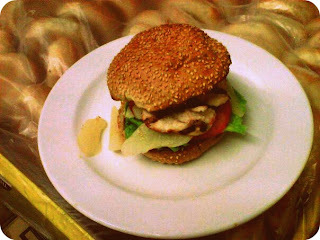 I am really craving that chicken burger now....yum! It was amazing. I am working again tonight for six hours so I am definitely having that again. Plus, I don't usually eat avocado so its a great way to eat some and I don't notice.